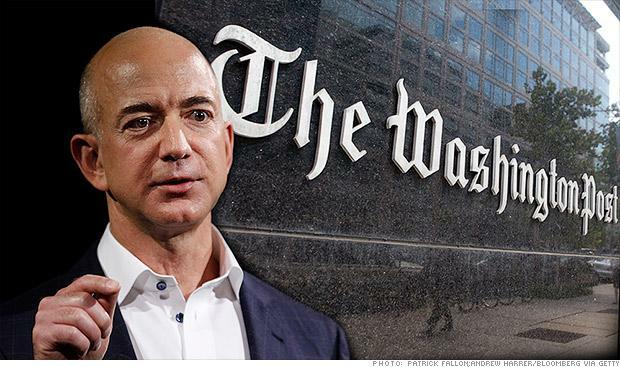 Is This Why Jeff Bezos Has Kept Quiet On WaPo Employee Khashoggi's Disappearance? Following reports over missing Saudi journalist Jamal Khashoggi, reportedly murdered and dismembered in the Saudi Arabian consulate in Istanbul by a 15-member Saudi team, several high profile business leaders have voiced their disgust over what appears to have been a gruesome, state-sponsored assassination. Virgin CEO Richard Branson announced on October 11 that he was suspending his advisory role in the Saudi Vision 2030 projects, followed by JPMorgan CEO Jamie Dimon, Verizon CEO Robert Bakish, Uber CEO Dara Khosrowshahi, AOL co-founder Steve Case - who have all distanced themselves from the Saudi government following the Khashoggi incident. What's more, the Financial Times, Bloomberg, CNN, New York Times, Economist and CNBC have all withdrawn from the Saudi Future Investment Initiative. Deafeningly silent, however, is Khashoggi's own boss - Washington Post owner Jeff Bezos, who has yet to issue any sort of statement. According to CNBC, "It's interesting that in a context where people are so publicly disavowing and disengaging that there's not been a clear statement from the owner of the newspaper," Félim McMahon, the technology and human rights program director at the University of California at Berkeley law school's Human Rights Center. "It's legitimate to ask that person's opinion." Perhaps Bezos has refrained from issuing a statement due to a lucrative deal to set up data centers in Saudi Arabia - a plan announced last year. It announced plans a year ago for the opening of a Middle East division based in Bahrain, an island nation that neighbors Saudi Arabia. Since May, Amazon has had a job post up for a "Head of Public Policy AWS Saudi Arabia" based in Bahrain. Part of the candidate's role is to "help further advance Amazon as a leading cloud platform provider in the Kingdom of Saudi Arabia." The position requires fluency in Arabic, and one of the top objectives is to "develop, lead and implement Saudi Arabia government affairs advocacy objectives and policy/political priorities" for AWS. Saudi money in general has permeated tech, with the country's Public Investment Fund having committed $45 billion to the Softbank inaugural Vision Fund, while Crown Prince Mohammed recently said he will invest a similar amount in the next fund. Other investors in the Vision Fund include Apple and Qualcomm, while Softbank has large stakes in Uber, DoorDash, WeWork and several other companies. Softbank's COO, Marcelo Claure said that the company is monitoring the situation. "Like most companies that have a relationship with Saudi Arabia, we are watching the developments and seeing where this goes," Claure said. "Right now it is business as usual — we are continuing to run our company, our funds." Meanwhile, a list of tech companies which have received heavy Saudi investments has been published by CB insights, and includes Tesla, Uber, Lyft and Magic Leap. "This would be a good moment for Silicon Valley to consider the nature of the government of Saudi Arabia and what that means from a human rights perspective," said McMahon, who was previously an investigator for the International Criminal Court and a journalist. "Maybe this is the moment when this guy's halo starts to get a little bit tarnished." According to McMahon, there was every reason not to do business with the Saudis prior to two weeks ago. But the U.S. government and some of its biggest companies have been drawn to the allure of a growth market that's being guided by the 33-year-old crown prince, who has passed reforms such as letting women drive and promoting a more moderate Islam. And while Khashoggi's disappearance is still a mystery, the world is still waiting to hear from his boss, Jeff Bezos.